With Sky Q, Sky has created a TV platform and ecosystem that truly fits seamlessly with a modern home. By flinging live and recorded content around rooms and across your mobile devices – while integrating online services like Netflix and Spotify – Sky Q is close to being the perfect home entertainment platform. Naturally though, you'll have to pay for the privilege. Sky Q is one of the best TV subscription services on offer right now. Since Sky Q first launched back in 2016, the premium platform has grown with a range of new technologies including 4K video and Dolby Atmos audio, support for voice control, integration with Netflix and Spotify, and extensive viewing options across smartphones and tablets for watching content while you’re on the move. We’ve been impressed by Sky Q's performance in our testing so far, which means it's hard to think of any downsides to the subscription service. What you get is a consistent, unified Sky Q experience, no matter which device you're on, be it living room TV, tablet, second room Sky Q box, or your phone. In terms of content, Sky Q still has the most comprehensive entertainment library of any equivalent service, with a wide array of on-demand, Sky TV and Cinema subscription packages, rental offerings, and much more. As you’d expect, there’s a premium price tag attached. Then again, we'd expect there to be: the quality of the TV content on offer through Sky's magic box makes this one of those rare examples of getting what you pay for, even when you're paying a lot. The Sky Go app is even on PlayStation and Xbox, and it's clear that Sky is confidently catching up with the way we're all consuming movies and shows these days, after changing the game itself with the launch of Sky HD a decade ago. 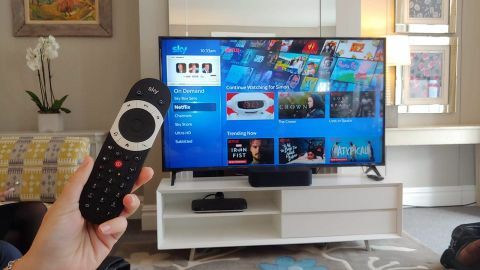 The fantastic Sky Q system is set to get better, so read on to find out what we think makes it so special – and why you might consider it over BT TV, Virgin Media, or a standalone Netflix subscription. The Sky Q box has a blue glowing ring to indicate playback. What is Sky Q? Sky Q is the British broadcast premium TV service, offering 4K video playback with a slick modern interface, multi-box multi-room streaming, Dolby Atmos audio and integrated online services like Netflix and YouTube. It's also got an extensive mobile component, not only letting you program recordings on-the-go, but take your recorded shows with you on mobile devices as downloads too. Is Sky Q wireless, and does it require a dish? While Sky is trialling broadband-only TV subscription services, right now Sky Q still requires that a user have dish installed. Additional Sky Q Mini boxes, which you can put around your home for Sky TV in other rooms, are to a degree wireless though – though the main box needs to be hooked up to a dish, Sky Q Mini boxes connect over Wi-Fi for multiroom viewing . Note too that Sky Q does support Wi-Fi connections for on demand content, but you're still going to need a satellite dish in order to access them. Do you need Sky broadband for Sky Q? No – Sky Q's online services will work with any broadband provider. However, additional Sky Q Mini boxes can be configured to work as Wi-Fi repeater hotspots, but this feature is only available to Sky broadband subscribers. It's a nice extra, but not essential to enjoy Sky Q. Does Netflix come with Sky Q? Netflix can be accessed on a Sky Q box, but it doesn't come for free – you'll still need to sign in with a paid-for Netflix subscription. However, if you opt for Sky's Ultimate on Demand package, it will integrate Netflix billing with your Sky bill, while reducing its cost and unlocking Netflix recommendations within the Sky Q interface. If you're paying for both services, it's well worth combining them in this way as a result. Is Spotify free on Sky Q? No – you'll need to continue to pay a £9.99 fee to access Spotify Premium on Sky Q, the only tier that is supported in the Sky Q app. However, like the Netflix deal, you can integrate it with your Sky Q bill, while new customers can get a few months free trial by signing up with the Sky Q app. Sky Q has been available since 2016. Three years in, there are several features that weren't available at launch. And we know about a few coming soon too. Top billing currently is the Ultimate On Demand subscription package. It allows you to combine your Netflix bill with your Sky one, and enjoy a Sky Q interface that integrates top Netflix shows alongside your Sky Q favourites and recordings. So, you'll see Stranger Things sitting alongside Game of Thrones, before letting you jump right into the standard Netflix interface. It works seamlessly, and is a wonderful way to browse all your viewing choices in one place. You still can't watch in HDR though, which is one of the few failings of Sky Q as a whole. Regardless, it's a thoughtful way of implementing the Netflix catalogue and well worth the wait – even if Amazon Prime Video is still nowhere to be seen. HDR is coming as well, we're told. We've been waiting for this for a while, and news that Italy's Sky service has already had its first 4K HDR broadcasts brings hope. However, there's still nothing concrete to report on this front. Another important extra you can enjoy now is advanced voice control. Talk to the remote and you can ask for specific movies, or actors, and use commands to navigate the interface. It's a pretty quick way to get around Sky Q. You can also access Spotify music streaming through your Sky Q box. Your existing Spotify account will work fine, or you can sign up for a free one, which now gives you access to a limited number of playlists you populate yourself. Sound for your movies has improved too. Sky Q supports overhead Dolby Atmos audio in many of its Sky Cinema movies, to get you closer to the "cinema in your home" experience. Most recently, Sky Q has launched a new Kids Safe Mode. The new feature is designed to give parents peace of mind by locking their Sky Q box in the Kids section, which means little ones can only access television shows and movies Sky Q has deemed suitable for its youngest viewers. Sky Q may be more expensive than some other streamed video services, but its technology is simply ahead of the rest. It is completely connected – each Sky Q box you add to the system speaks to the others. If you record something on the main Sky Q box downstairs, you can access it upstairs. If you are mid-watching something, you can pause (as long as it has been recorded or is being recorded), then pick up from where you left off anywhere in your home using the iPad app. The Sky Q box is very slim. There are two options with Sky Q. We have the pricier Sky Q 2TB box, but there is a 1TB box that can still take advantage of the "Fluid Viewing" experience – it just misses out on a few features. The standard Sky Q box has 1TB storage, the ability to record three things at once and watch a fourth, and you can also stream to one tablet; both boxes also act as a Wi-Fi hotspot. The Sky Q premium 2TB box ups the storage, lets you record six things and also watch a seventh. And you can stream to two tablets. You also need the higher-end box to watch 4K content. There's no difference in size between the two. The boxes both measure 232 x 155 x 34mm, which is a considerable reduction in footprint compared to the older Sky HD box (398 x 283 x 81mm for reference). The Sky Q box in comparison to the older Sky HD box. These main boxes are part of a bigger mesh network. It is powered by a new Sky Hub that offers dual-band wireless 5GHz technology (Sky may have to upgrade your router if you sign up for Sky Q). As Sky Q creates its own mesh network, there's no additional pressure on your normal Wi-Fi connection. It actually improves Wi-Fi coverage as each box you add also acts as a Wi-Fi hotspot. The technology behind this mesh network is being provided by AirTies. According to this company, the service allows 10 premium video streams simultaneously from multiple sources, including live broadcast, PVR recording, OTT from the internet or from a local NAS server.